TOKYO (Bloomberg) -- Honda Motor Co. raised its profit forecast as surging sales in Asia outweigh the impact of a stronger yen. Honda expects net income of 500 billion yen ($6.2 billion) in the year ending March, compared with an earlier estimate of 455 billion yen, the company said in a statement today. Sales may rise to 9 trillion yen from 8.6 trillion yen, the automaker said. The company’s car sales increased in Japan and other Asian countries during the fiscal first half, while the company also raised its forecast for global motorcycle sales and said it would reduce capital spending. Honda raised its profit outlook even as the yen trades near a 15-year high against the dollar, reducing the value of overseas earnings. Still, based on today’s statement, Honda expects to earn only 92 billion yen in the fiscal second half, compared with 408 billion in the first six months. Mazda Motor Corp., whose longtime affiliation with Ford Motor Co. is being reduced to a small equity holding, also raised its annual profit forecast today on increased sales in North America and Europe. Toyota Motor Corp. President Akio Toyoda this week said he felt an “an extreme sense of crisis” because of the strong yen. Toyota, the world’s largest automaker, reports results on Nov. 5. Honda’s net income increased to 136 billion yen ($1.68 billion) in the three months ended Sept. 30 from 54 billion yen a year earlier, the company said. Sales rose to 2.25 trillion yen ($27.87 billion) from 2.06 trillion yen. 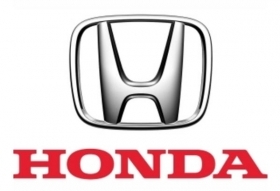 Honda today revised its full-year exchange-rate assumption to 84 yen to the dollar from an earlier forecast of 87 yen. The company expects the yen to average 80 against the dollar in the fiscal second-half. The company will also cut costs by trimming capital expenditures by 20 billion yen from an earlier plan, to 360 billion yen for the year through March. “Our localization of production in North America is at a good level, so we need to make sure that we can be profitable with our export models,” he said. Honda makes 87 or 88 percent of the vehicles it sells in North America in the region, he said. While the company could consider overseas production for newly introduced models, it is unlikely to offshore output for existing models, he said. The maker of Accord sedans lowered its global vehicle sales forecast to 3.615 million units from an earlier estimate of 3.64 million, citing weaker demand in North America and Europe. “The North American market is not recovering as much as we had earlier expected,” Kondo said. Honda also faces declining sales in Japan after a government subsidy program for fuel-efficient cars ended Sept. 8. The company’s deliveries in September dropped 12 percent. Sales in its domestic market rose 13 percent in the fiscal first half. To boost sales, CEO Takanobu Ito is expanding Honda’s gasoline-electric hybrid line-up and unveiled a hybrid version of the Fit compact, its most popular model in Japan, on Oct. 8. The carmaker will introduce a 500,000-rupee ($11,200) car in India next year and plans to sell a similar model in Thailand, Ito said on July 21. Sales in Asia outside Japan increased 15 percent from in the six months through Sept. 30.